StorDigital DupaLIVE â€“ a new modular recording, duplication & data extraction system for Blu-Ray, DVD, CD and USB. DupaLIVE is a network ready, multiple target duplicator range that supports the live recording and printing of DVD, CD & Blu-Ray discs. DupaLIVE features an embedded PC that supports and controls a host of advanced functions not available on a standard duplication tower. Supporting live audio recording, audio editing, and multi target disc duplication as standard, StorDigital DupaLIVE ships with a powerful application suite providing live event organizers, concert promoters and churches with all the tools necessary to ensure professional and speedy disc distribution. Optional enhanced functions include onboard LightScribe label design and disc printing, USB duplication, Blu-Ray duplication, automated disc printing and automated MP3 extraction. This new concept in duplication from StorDigital represents a turning point in duplication technology. Perfect for digital facilities, production houses, media agencies, AV installers, churches and live event organizers, the DupaLIVE system is a flexible workhorse that can adapt to your needs and grow with your business. StorDigital founder, Nic Ranshaw said, â€œAs a company we strive to keep in tune with our customers needs. DupaLIVE is a response to an emerging trend for â€˜Just in Timeâ€™ duplication, whereby the value of the content is determined by the speed that it gets into the customers hands. By enabling the DupaLIVE to operate as a live recording device, editing platform, and tower duplicator we have developed a genuinely unique product. So many of our customers come to us and say, â€œCan I record on the duplicator?â€. Now thanks to StorDigital DupaLIVE the answer is a firm â€œYes!â€. The DupaLIVE range brings further advantages to consumers. Many duplication professionals offer live duplication, conference recording or sermon recording services. Live events require speed and efficiency in order to get the product into peopleâ€™s hands in the fastest possible time. DupaLIVE offers the user the chance to do real time digital recording, mastering and duplication via one self contained unit. No more is there a requirement for an additional disc or hard disk recorder. DupaLIVE operators have an all-in-one, easy to use solution in a single box. 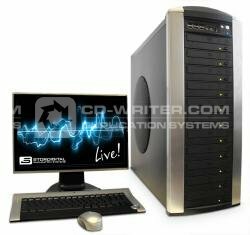 DupaLIVE is a powerful PC workstation, pre-installed with Windows XP and hosting a suite of applications. Included software supports the recording, editing, and mastering of CD/DVD discs and label designing software for both inkjet and LightScribe printable discs. The StorDigital DupaLIVE system will be available from StorDigital direct and their resellers from August 2009. Configuration subject to change without notice. To arrange a demo call StorDigital on 020 8293 0777. About StorDigital Systems: StorDigital Systems was founded by CD-writer.com Ltd in 2002. They are now a leading UK manufacturer and supplier of specialist DVD, CD, Blu-Ray and USB duplication solutions. The range includes tower copiers, robotic duplicators and automated printers for DVD, CD, Blu-Ray and flash media. You can contact StorDigital Systems online at www.stordigital.com or by calling +44 208 293 0777.